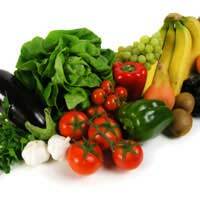 Health experts agree that eating a healthy balanced diet is the best way to get all the individual vitamins you need. So if you’re keen to make sure you’re getting everything you need for a fit, strong and supple body, the best place to start is by looking at your diet. ‘Everything in moderation’ may be a cliché, but it’s a phrase that rings true when it comes to nutrition. Eating lots of different kinds of foods (though not necessarily in huge amounts) is a key way of making sure you collect all those important nutrients that your body needs every day. When it comes to fruit and veg, it’s a good idea to try to ‘eat the rainbow’ every day. Different coloured vegetables often pack a different vitamin punch. So try to include something green, something red, something orange or white at meals throughout the day - think lettuce, tomatoes, peppers and onions! Not all vitamins are found only in fruit and veg. You can get your vitamin A from pate as well as carrots, and your B6 from brown rice as well as bananas. So fill yourself up on hearty, healthy rice, potatoes, lentils and pulses, and then top up with all that lovely fruit and veg. You’ll be onto a winner when it comes to getting all the right vitamins for your body. Essential for vision, skin and a healthy immune system, vitamin A is found in liver and dairy products. There isn’t actually any vitamin A in carrots, but along with other yellow and orange vegetables, carrots contain beta-carotene, which your body can turn into vitamin A. You can find these important vitamins in all sorts of foods, many of which you’ll eat regularly as part of your everyday diet. Vitamin B1, which is good for your heart and nervous system, is in whole grains, flour and bread and many meats. Vitamin B2, which is good for growing bodies and essential in helping your body release energy from food, is in eggs, liver and green vegetables. Vitamin B3 is important in building the structure of the skin. It’s in bread, liver and yeast extract. Vitamin B5 is a big player in the production of red bloods cells in your body. You’ll find it in chicken, eggs, beef, broccoli, tomatoes and potatoes. Vitamin B6 is necessary for a healthy nervous system and blood function. You’ll be eating up plenty when you go for fish, chicken, or eggs. Vitamin B12 helps you release energy from food and is important for the production of red bloods cells. It’s in fish, dairy produce, meat and yeast extract. As many people know, vitamin C is an antioxidant vitamin and it plays a key role in keeping your immune system fit and healthy. But beyond that, vitamin C helps with the healing of wounds, and the absorption of iron. You’ll find plenty of vitamin C is strawberries, blackcurrants, oranges and other citrus fruits. You need vitamin D in order to absorb calcium – an essential for teeth and bones. Your body can manufacture vitamin D from exposure to sunlight, but you’ll also find it in oily fish, dairy products and eggs. If you want healthy, glowing skin, you want plenty of vitamin E in your diet. It’s another age-defying, anti-oxidant vitamin and you’ll find it in nuts, avocado, vegetable oils and seeds. The key to normal blood clotting and development of bone structure, you’ll be eating vitamin K when you choose spinach and other leafy green vegetables. Of course, this is just a brief guide to the kinds of things you could eat in order to achieve a healthy, balanced diet. But there are hundreds of different options. So, if you don’t like a particular food, seek out one of the many alternatives that could replace those lost vitamins. Don’t like oranges? Eat strawberries – they contain even more vitamin C! The key is to eat as wide a variety of foods as possible, and don’t eat the same things day in and day out. Be adventurous; keep trying new foods, and the health benefits of all those vitamins are sure to follow.